This well decorated home is both stylish and inviting. A great place for couples or families with younger children to unwind. This is a dog friendly home so please bring them along because every dog loves the beach. The large picture window provides unobstructed views to the stunning Pacific Ocean beyond. Stroll through the tall grass on a great adventure to the sea just outside your door. With the windows open you can let the dramatic sounds of the ocean lull you to sleep. Assorted kids toys and game can be found in this condo perfect for little ones to stay entertained while parents relax on the deck of reclining chair. Peaceful & relaxing stay, with a lovely view. My wife and I were looking for a small weekend get away to recharge and relax; Wow did we ever find it with Vacations by the Sea and the wonderful condo we rented. The view from the living room of the Ocean and the Balcony was breathtaking! Not to mention while we were having dinner in the Condo, the sunsets were Amazing and the sound of the Ocean in the background was calming and relaxing. The Condo was decorated so perfect; was clean and just a wonderful experience over all. We loved the grounds and the activities that were available. Cant think of a better place to go if you just want to get away. We will be returning and making this a tradition in our summer vacation plans. 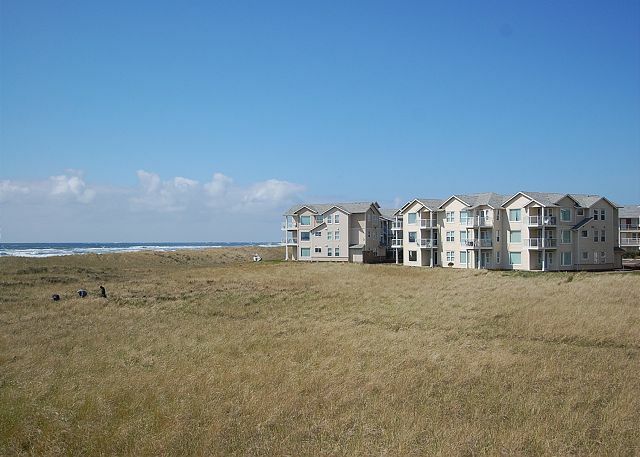 Beautiful condo with spectacular oceanfront view. Great supply of dishes and cookware. Highly recommend this cozy unit. Nice work on the dune restoration. The deer like it too. Great view and location but the condo had a smell. We had to open windows and doors to air out the space. We slept with the windows open. We really enjoyed our stay. We have stayed at many of the condo's in this complex and this was one of the nicest. Great view, comfortable beds and pet friendly for our four legged friends. The room was very clean as usual & we enjoyed our stay, however our Wi-Fi didn't work even after we called for help. Thanks for staying with us and sorry to hear you were having difficulty with the WIFI. When we checked the WIFI after your call everything seemed to be in working order. We didn't receive any other guest complaints from the building so thought the issue was resolved. Please let us know next time you visit if you still have problems which might indicate an issue with the device itself instead of the WIFI. We'll help you diagnosis best we can. Hope to see you again. This is the 4th time we have stayed at Vacations by the Sea. This particular unit was the unit my son and his wife stayed in. They enjoyed their unit very much and can't wait to go back. The unit was spacious and had everything they needed in the kitchen for their weekend get away. Our unit was a 2 bedroom condo also dog friendly. We keep coming back because of the amenities, the view and the staff is AMAZING! Jackie, is a joy to work with. We can't wait to return and bring our other son too! It was a great experience. Not the best weather but the clubhouse and amenities made up for the lack of Beach time, which was needed with a 4yr old and a 1yr old. The condo is so clean and very cheerfully decorated. Everything you need is available. The location is perfect. The rental agency was incredibly gracious, kind, and helpful. I've not seen any other rentals, but don't need to. This one is perfect! My new vacation spot. First, thanks to Jackie for exceptional help with booking. Second, the condo was super clean and comfy with spectacular views and a lovely walk to the sand. We hope to visit again soon. We always choose this unit. Comfortable, well stocked of books, movies, games, kitchen for family of all ages and everything a cook should need. We are a fam of 4 and bring our air bed so kids can have mstr bedroom with own tv, games; and and parents sleep by the fire listening to the ocean. This is our official happy place. We LOVED this unit! The view is Amazing!! This is our second stay, and we didn't think it could get better (well the weather could have been!) But the room was great, the big picture window in the living room has an unobstructed view of the ocean. Everything was clean, and our 3 year old loved all the special toys, legos and puzzles to play with. As always, we enjoyed our stay and view. My husband & I decided at the last minute to try to see if there was a condo for a quick trip during Thanksgiving. Much to our delight, there was one condo that allowed dogs that was available. This was our 2nd time to visit Vacations by the Sea. Management is absolutely fabulous and so accomodating to all our needs. 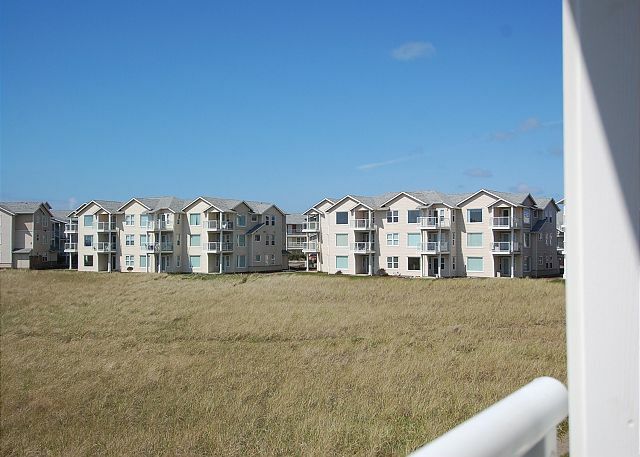 The condos have always been comfortable and clean and so convenient to the beach. We recommend Vacations by the Sea with out hesitation We look forward to our next visit. Very relaxing & peaceful, with some wonderful walks on the beach! Management company was easy to work with and responsive. The process of renting was easy. The property was clean even the deck furniture. The view was stunning plus you are right by the trail to the beach. The bed was comfortable and loved the added touch of the bathrobes! This is the best stocked kitchen we have seen in a vacation rental. They have thought of everything. Plus the pans were in good condition You can really plan on cooking your meals here! Great time at the beach and we will come back! This was a nice condo with a great view. Kitchen was well equipped and the towels and sheets all were nice and freshly washed. The bed was a little soft for my taste, but relatively comfortable. TV and furniture a little dated, but overall the condo was very comfortable for our trip! Pet friendly, clean, and excellent ocean view! Very clean condo and great location. Condo is bigger in person versus pictures online. Excellent view of ocean! Enjoyed our stay very much and will rent again. Nicely furnished and well set up. Would recommend to a friend. This was our second time saying in this condo and it's better than anything I've rented before in Westport. You can't beat the price and it feels like I'm at my home away from home. Great location and nice views from this unit. Kitchen was very well stocked. The only complaint is that we couldn't get very good sleep because the curtains in the master bedroom were insufficient in blocking out the outside lights (they were shining right into the condo bedroom). If the owner could add a second thicker curtain, we'd definitely stay again. Super place, nice people, 5 Stars all around! We had a wonderful time and it made it even better that we were able to bring our furry friend with us! He had a fabulous time playing at the beach! We will be back!! Great short vacation. Perfect location. A bit overpriced. Westport is charming. Bennett s fish was the best. I would highly recommend this vacation rental. I wish I could have stayed longer because the ocean view was spectacular and the room so comfortable and clean! Very dog friendly, too!The staff were friendly and helpful. 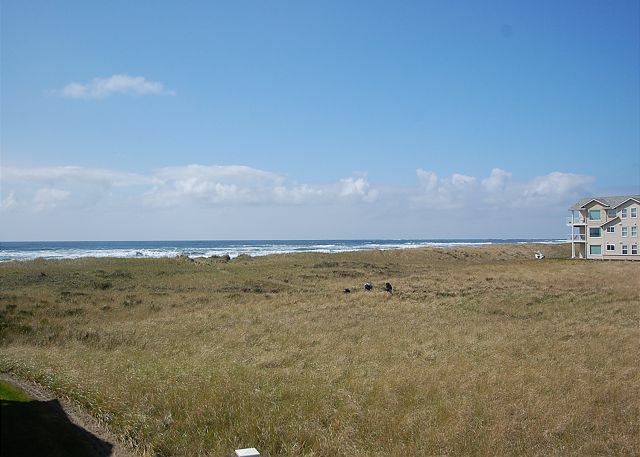 The condo location was located near a famous lighthouse and great surfing site with terrific hiking trails and observation points. Can't be beat! THE DOOR TO THE DECK WOULD NOT CLOSE TIGHT. THE SPRINGS IN THE FOLD OUT BED WERE NOT COMFORTABLE. I WOULD COM BACK AGAIN FOR SURE. We rented this property for our small beach wedding. It was fabulous. Clean, great space. The best part was all the family friendly adds. We had two young kids and the place was stocked with fun toys, games, and kids movies. The kids (and us) had a wonderful time. Again, we had a blast staying here! The beach is just a two minute walk from the condo. I love the fully equipped kitchen. Make sure you go to float 8 down on the pier and pick up fresh seafood to bring back and cook! This place had everything I needed! Even Bath and Body Works soaps and lotions! We will always come back here to stay. I couldn't imagine staying anywhere else. Great Location and Bring Your Dog! We had another great stay at Vacations by the Sea. 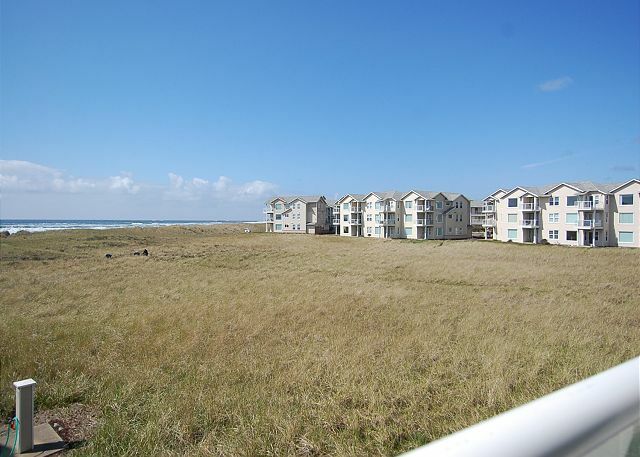 223 is a nice condo - great location, just one flight of steps up and easy walk to the beach. Weather was beautiful! Our dog loved it and we didn't see any trace of previous dogs. The only reason the I gave a 3 star to maintenance is the bathroom floor wasn't clean. Thanks for staying with us again and we're happy to hear it was another great stay. Sorry we didn't meet your expectations 100%, we'll try to do better next time. Everything was great. I cooked the Thanksgiving dinner after spending most of the week there. The only frustration I encountered waere the permananent residents that just let their big dogs run the property, pooping and not picking it up. I have a dog and followed the rules, kept my dog on a leash, cleaned up after but it was as though they were exempt to the environment and the rules. I've stayed at the condos in the past and will again on the future but will not rent a unit by the folks whole live there full time. Thanks for staying and being a conscientious pet owner. The same rules apply to everyone staying on property so we're sorry to hear your full time neighbors weren't helping to keep the place clean. Thanks again for staying with us and looking after your dog, rental condos get alot more scrutiny and we appreciate our guests helping us. We had an amazing time. The unit was neat and clean. The view is picturesque. And the people are friendly. 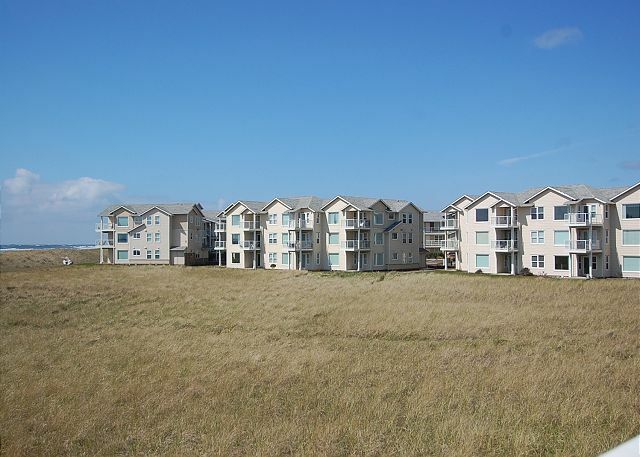 The beach is just steps away and the community is very pet friendly. We stayed for two nights and we loved the place. The condo was nice and clean and had all you needed to make a home away from home. One of our windows would not close and Ihappened to meet someone who worked tthere and told her about it. She came over and fixed in within 10 minutes. It took us a while to figure out how the disposal worked. There is a plunger thingy that you insert into the unit to engage the switch. We really enjoyed how quiet it was. It's such a drag when you have noisey and inconsiderate neighbors. That wasn't the case. I would suggest to the owners that the furniture be updated. The bed was way too soft, like falling into a hole. The sleeper sofa is dated and its mattress is paper-thin. The TV is HDTV, but the Comcast feed is SD so it's a waste of a decent TV. Upgrade the service to HD! I would suggest to future renters to stop in Aberdeen and stock up on groceries. There are local stores too, but they are small and about 9 miles away. I didn't mind that too much because it's good to support local businesses. Still, if you have a lot of mouths to feed, you might want to stock up in Aberdeen. We would definitely stay here again. The VBS people have their act together and are professional and courteous. A little spendy, but considering the quality you get, definitely worth it. My husband and I had a wonderful time here over the Memorial Day weekend. The condo had a fantastic view of the ocean and was very clean and well-stocked. The furniture and decorations are super cute and make for a very relaxed atmosphere. We stayed in the entire time since we enjoyed it so much. The staff were very helpful and professional. I highly recommend this place and would stay here again. The only problems we had were with the door lock and the cleaning staff apparently were in a hurry and left a spray bottle and rag in the bedroom. Otherwise perfect. The room was great and the view phenomenal. And just a short walk to the beach and the dune trails. Always relaxing and beautiful! Thanks for the great review and finding our lost cleaning bottle! Sometimes with guests departing and arriving on the same day little things like that can get missed but we try to ensure every condo is as great as it can be. We've oiled the lock to make it easier to open and hope to see you again down the road. We recently stayed here for our honeymoon, and we couldn't have asked for a better stay! The room was amazing and comfortable, it is right next to the beach, and had everything we needed in the room. We are so looking forward to another stay in the very near future! WE HAD AN UNBELIEVABLE VACATION BY THE SEA. THE VIEW WAS GREAT. THE OCEAN WAS PRACTICALLY IN THE LIVING ROOM. THE UNIT WE STAYED IN WAS VERY CLEAN, INCLUDING THE WINDOWS WHICH MADE THE OCEAN APPEAR THAT MUCH CLOSER. THE BEACH WAS EASY TO GET TO FROM OUR UNIT AND WE HAD WONDERFUL WALKS ON THE BEACH WITH OUR DOGS. IN THE EVENING WE SAT ON THE LANAI AND WATCHED THE WAVES CRASHING AND SUN GOING DOWN. WE HAD AN AWSOME TIME. CAN'T WAIT TO GO BACK. Enjoyable, peaceful & relaxing. We were fortunate to be able to walk the beach on several occasions each day. Thanks! A very nice condo with lots of room. Walk to the beach. Came to visit son who is in the Coast Guard in Westport and it was the perfect place to stay. A few minor things needed to be taken care of such as a burned out light bulb on the balcony and we never could find a switch for the garbage disposal. Nevertheless, we will definitely stay here again. Thanks for letting us know about the light outside, we'll get it replaced right away. With the condos in building 1-4 you have a black plastic plug which goes into the sink to activate the garbage disposal, old school but it works fine. Glad you had a wonderful visit with your son and we can expect to see you again. Had a very nice time (our 6th or 7th stay at Vacations by the Sea). This was one of our favorites for a one bedroom condo. Only odd thing: we did wonder why a switch for the disposal is no where to be found. Deliberately left unusable? Although we could tell it is wired in. Wonderful to hear you are such a frequent visitor to our condos and had another great time. In buildings 1-4 the sink disposal is activated by keeping the water running and then putting the plastic plunger looking thing into the sink and pressing down, a little old school but it works great. The rest of our condos have a more traditional style disposal with a switch at the sink. The information book in the condo should have instructions but we'll check that unit to make sure. Feel free to call us anytime you have a question about the condo you are staying in, we're happy to help! We were there to dig clams for the first time. No cleaning in the room yet no place to clean on the premises. Other then that it was a very nice time. Happy to hear you had a great experience clamming in Westport. Our terms & conditions do not exclude clam or seafood cooking in the condo, we just ask sand, shells, etcs not be put down the garbage disposal but rather in the trash and not left in the condo. The beach is the best place to enjoy fresh seafood and we'd never limit our guests enjoyment of that! See you next time. We have stayed in several of the units (it's kind of an annual tradition for us) and have never been disappointed. The view is amazing, the rooms are beautiful and perfectly stocked, whether for one day or more, and the staff have always been very helpful. We enjoyed our stay very much. The room was clean with a great view of the ocean. The kitchen was well stocked with appliances. The furniture is in good shape and comfortable although the lamp in the bedroom wouldn't work. Our dog ruby loves to play on the beach and lay out on the bolcony watching the sparros nest. The only thing i was puzzled about is that no where to be found on the property were there recycling bins? Is it possible that the town of westport doesn't have recycling? We ended up taking our recycling home with us for we could not bring ourselfs to throw away glass bottles and cardboard. Overall a very nice experience thank you. We stay at room 223 Vacations by the sea and had a wonderful weekend, condo was fully stocked with everything we needed. Everything was neat and clean when we arrived and easy check in and check out!! It is a magical place. We had a very relaxing time walking on the beach and listening to the waves from our condo. We really enjoy unit 223. This was our 4th stay there and I highly recommend it to anyone who wants to visit the coast for a few days. Thanks for staying and your repeat business! We're very pleased we continue to meet your expectations and look forward to seeing you again in the future. Perfect beaches with all colors of pebbles for my secret garden are just a short walk thru' dips and rises of the secretive dunes. A light house to alert ships of the horizon, fog horns to tell us of their travels. There's privacy to feel the experience of beauty and space all around. our second visit to Vacations by the Sea, still wanting to come back for a longer stay!! 1 night is not enough time to see and do everything there is to offer! the property and view is wonderful. our unit had everything to offer, games, music, comfort! Stayed in Unit 223 for 3 nights at the end of March, 2012. Fantastic weather, which made the experience all that much better. In general the unit was clean and well kept, there were a few minor wear and tear things, but nothing worth mentioning specifically. Extremely well stocked kitchen as far as dishes and utensils. The view was pretty good (suspect even better from a third floor unit, but pretty good here, could definitely see the water, but not really the sand of the beach due to the dunes and grass). The only suggestions for the unit itself would be HD service to match the HD TV (watching non-HD is not much fun on an HD TV) and a bigger / better TV in the bedroom. The complex overall was great, ample parking, lots of amenities in great shape, plenty of footwash stations and trails to the beach. Would definitely stay here, both in this unit or in another unit, again. We were very fortunate to have wonderful weather in Jan & yet peace & quiet. Our place was clean, roomy, quiet & we had a nice view. The beach was accessable & geat as well. Thanks for staying with us. If you ever find the beach access directly in front of your building difficult during the winter months, just take a quick stroll north to the property edge and there is a concrete walking path along the state park boarder which will take you to a much eaiser beach approach. relaxing way to spend the holidays! Thank you for providing us with a great holiday getaway. It was quiet, a great view and a warm, cozy feel. Best of all, both dogs and people loved that it's just a 2 minute walk to beach! It was a nice get away, but like being at our own home, because everything was there. The ocean was outstanding and the weather was just made to order. Thank you for having us . The room and the amenities were very good. The staff was, however, just OK. I was told the check in was at 4 but if I got there and the keybox was on the door I could go ahead and occupy the room. My wife and I arrived about 1 and was told the room was being cleaned and we waited about a half hour and observed the cleaning person leave the room. We then left the property and came back in an hour to see there was no keybox. I thought, given they knew we were waiting they would have taken a moment to put the keybox on the room. Additionally we asked for a hour late check out (noon) and was told that would be OK--only to have the cleaning lady show up at 11:00 AM--while my wife and I were showering--not cool. The room was great and the view was fantastic. Will I go back? Probably but not for a while. We're glad you loved the place and sorry for any miscommunication on the part of our staff. We always like to give our guests a late checkout if it is possible and we pre-check all our rooms after cleaning which was probably the delay in checking in. Next time swing by the office at the clubhouse to let the front desk staff know you are here and we'll be sure to give you a call when the room is ready. See you next time! We really enjoyed our stay in unit #223. The unit was very clean and had everything we needed. Our dogs loved the beach time and we enjoyed getting to bring them with us. Thank you!! Everyone loved the condo. Will do it again. Great service. Very relaxing and close to the beach. Enjoyed the room with a view of the waves. Quite for the most part. The peoplewere very professional. We wanted a place to get away from the pace and relax. It was our 45th aniversary, and this worked out just right. Thank you for spending your anniversary with us at Vacations by the Sea! We are so happy that you enjoyed your stay & look forward to seeing you again soon! My husband and I plus our dog found this 1 bdrm/1.5 bath perfect for the 3 of us. 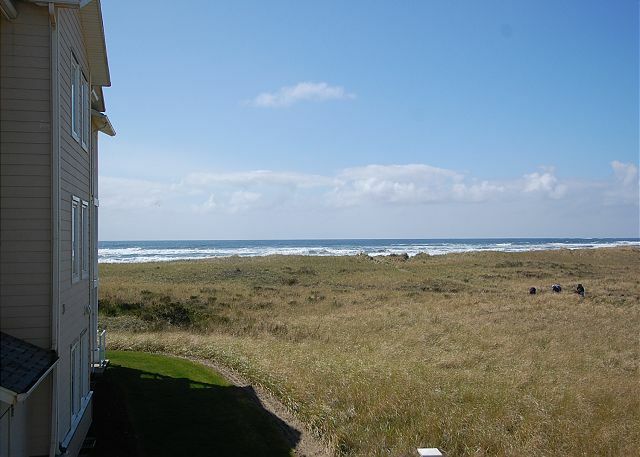 Ocean view, breezes, birds, dunes all within view from our living room window or the balcony. Our condo unit #223 had everything we needed to prepare our own meals each day. Washer/dryer too, so we were able to pack light. Right next to the doggie area, so that was convenient as well! Great unit. Would definitely rent this one again! We brought our two dogs and a very relaxing weekend. From the living room we saw two gray whales in the ocean, which was absolutely amazing. Seeing Gray Whales from the condo's is always something we hope our guests get to enjoy but it doesn't always happen, you are very lucky!!! We've been on the beach on two occasions and had a pod of gray whales lounging as close as a 100 yards offshore and I know the local whale watching trips are always a fun adventure for all ages. Glad you are able to take home such a wonderful memory of the beach. We absolutely loved our stay and plan to return again for longer. Next time though, we will probably bring an air mattress rather than have our daughters use the sleeper sofa. The mattress was very uncomfortable -- they could feel the springs. Other than that, the unit was great! The master bed was very comfortable, everything was clean and well stocked. We loved it! Thanks for staying with us, we're glad you had a great time! We will let the owners know your thoughts about the sleeper sofa mattress. We just learned of a way to replace sofa mattresses with a more comfortable option, and hopefully will be able to remedy that! Pleasant stay as always. Will be back again for sure. Thanks for staying with us again and we look forward to seeing you in the future. We felt very welcome as soon as we opened the door! A place very well stocked with a fantastic veiw. We highly recommend this place to stay, wish we would have had more time to enjoy it. Another great plus is that it's dog freindly and you wouldn't have even known it. Once again our stay was wonderful. We really enjoy the facility. Thank you very much! We're glad you had a relaxing and comfortable stay and we hope to see you again soon. Thanks for stspending your Thanksgiving weekend at Vacations by the Sea! It was so wonderful to see so many families getting out and enjoying the wild winter beach this weekend! Happy Holidays! Thank you very much for the high marks and we're glad you have a great stay. Electronics can be somewhat confusing if you are not familiar with them but we tried to take care of that with instructions on each of the components showing what the settings should be to watch TV or a DVD but if you ever have trouble again please let us know and we'd be happy to come and help. Thanks for the wonderful review and I'm pleased everything was to your liking in the condo so you could just do nothing and enjoy the ocean! Our rental condo was super convenient to the beach, and we had a wonderful time with our dog. Nice and quiet, we'll be back! by those talking on their way past you. We plan to return and would highly recommend the condo. Fantastic! Vacation by the sea is a magical place. I will come back every year. Property manager is great and very accomodating. The location is great with spectacular views and very relaxing atmosphere. We had a lovely stay, and enjoyed ourselves immensely, as did our schnauzer, Vinny. We had a great time while we were there, this is one place we will recomend for friends and family to stay. we will stay here again for sure. A perfect week--the ONLY good one weatherwise all spring! We have been to Maui 29 times and I would rather come here at any time of the year. We are so happy our dog is welcome, too! The condo was excellent. Great view of the ocean and a nice easy walk to the beach. We loved it and will return for sure!! We had trouble with our computer when we first arrived and the manager spent a lot of time with us to make it so it would wook. He was very helpful and nice to us. We appreciated his help. Thanks for the great review, I'm glad I was able to help get your laptop connected even if it was through a wire instead of our WIFI in the unit. Hope to see you again soon! Everything was great, but I was surprised by the $50 cleaning fee. Typically that is part of the cost of a hotel, so a bit of a shock (though it's written within the three pages of property description, which I never read). Otherwise great! The people were very helpful, the occomodations were overstocked with supplies, and the location was perfect. This would be a really nice place for a family to spend three or four days. My Husband and I stood there for a long weekend and enjoyed every bit of it. The view to the sea, the closeness to the beach, the condition in which the subdivision is kept, not to talk about the condo itself is outstanding. From the friendly Manager to the staff, all just fits, there is always some one cleaning and you actually can't tell, that those condo's are situated about 100 yards away from the sea. The condo itself was great, fully equipped invited it to actually not wanting to leave at all, very well maintained and all is there what you need while staying. Would we come back again? Any time, as we are making already plans. Great spot to relax & enjoy the view! The new check-in procedure works fine but seems a bit impersonal. We had stayed there in the past so knew where everything was so we did not have to ask for any help except figuring out the TV/VCR procedures were totaly different from ours at home so caused a bit of frustration to figure out. Loved everything else about the place! We're glad you had a wonderful stay with us. The check-in procedure was changed at the request of the property home owners association and guests have commented positively because it allows them to go directly to their unit instead of coming to the clubhouse to fill out paperwork. Please stop by the clubhouse anytime to say hello to Trish and the girls or just enjoy a cup of coffee, check out a movie, or browse our donated book selection. Hope to see you again soon! Cannot say enough about this great unit! Well equipped with everything, outstanding view, very close walk to the beach and park and our dogs loved it, too! Thank you for the great review! We hop you can stay with us again soon. A well-appointed, comfortable waterfront unit which permitted us to include our well-behaved dog during our stay. We will definitely return during the off-season. Thank you for sharing! The remote for the DVD player was missing and so we couldn't watch a few DVD's we brought for the kids which was frustrating. Other than that, it was terrific! Thank you. Sorry you couldn't find the remote. Next time please call the office, we will have someone come up and locate it for you asap, or find an alternate solution. We have young children as well and can definitely relate to that frustration! I had a wonderful and relaxing stay, which is exactly what I needed after a busy holiday season! The condo has a great view of the ocean and was very clean and comfortable. It had everything I needed. I hope to make it back soon! Great Location, Nice Beach, Good View! My wife wanted a spontaneous trip to the ocean that we could bring our dogs to. Vacations by the Sea was an absolutely awesome way to go. The room was great, the view was fun. It was incredibly dreary and rainy, yet we still managed to have a blast. Couldn't recommend it more. We come here 4-5 times/year and LOVE IT! Can't wait to go back. Very disappointed the hot tub was not working...would have liked to have known that prior to the visit...one of the reasons I come is the pool/hot tub along with the great beach! We're sorry that the hottub was not open for your stay. We always try to let our guests know beforehand if this ammenity will not be available, but we are often not given advanced notice if an emergency repair is necessary which was the case in this instance. We hope you enjoyed the rest of your stay and look forward to seeing you again in the future.